Tom Lasich and colleagues designed a simulated case training program delivered for law enforcement authorities of the DRC. The case scenario had to be realistic and in accordance with the political sensitivities of the region. Visiting officials from Kenya, Rwanda and Uganda joined the approximately 35 enforcement officials including investigators, prosecutors, Financial Intelligence Unit (FIU) representatives and customs officials in attending the 5-day course. The case scenario was based on a hypothetical case involving Cassiterite smuggling by an international gang working closely with an outlawed armed group operating in the eastern DRC region. The scenario begins with 3 whistleblower complaints in response to a newspaper article about a large quantity of Cassiterite seizure in Rubavu by Rwandan authorities. The investigator charged to investigate this case is role-played by a 5-member team in the training class. Over 35 pieces of evidence such as vehicle and home registration documents, witness interview records, cancelled bank checks, mutual legal assistance documents for international cooperation with Belgium, aided by the DRC FIU ( CENAREF) were designed into the simulation. 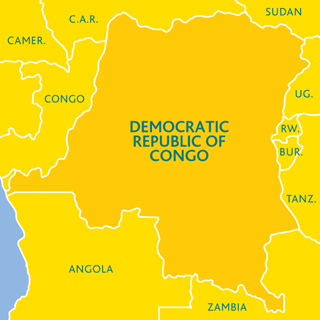 Money laundering, asset forfeiture and confiscation statutes of the DRC penal code were used. The training also consisted of lectures on topics such as Money Laundering, proving Elements of Crime, Asset Forfeiture & Confiscation, FIU involvement, tracing illicit money flows, Mutual Legal Assistance (as specified in the UN Convention Against Corruption and the African Union Treaties); and use of Open Source Intelligence (OSINT).